This is the beginning of a series of quilts exploring the idea of flights of the imagination. In the five month period, from May to September of 1993, while my studio was being built, I was unable to get a much needed leave of absence from my job with the airline, so I flew a full schedule. During the same five months, I also flew over 25,000 miles as a paying passenger, on teaching trips to Honolulu, New Zealand, Fairbanks, and Columbus. By September I was exhausted. One morning, the first week of September, I woke up with a clear idea in my head for a new quilt. I must have dreamed it. This was a gift. I don't often have ideas that just pop into my head, so I've learned to pay attention to them when they do. I ran out to my studio at seven in the morning and did a series of small sketches, trying to capture the idea before it escaped. The title was in my head too. It was FLYING FREE. 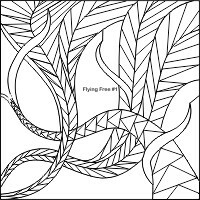 For me the idea of flight has always symbolized the ultimate feeling of freedom. I wanted to capture that essence in my design. I felt compelled to work on the quilt even though I was leaving for Switzerland within a few days. I chose the thumbnail sketch I liked the best, and put it through a series of evolutions until I had a finished design. This was projected onto paper to made a full size drawing. 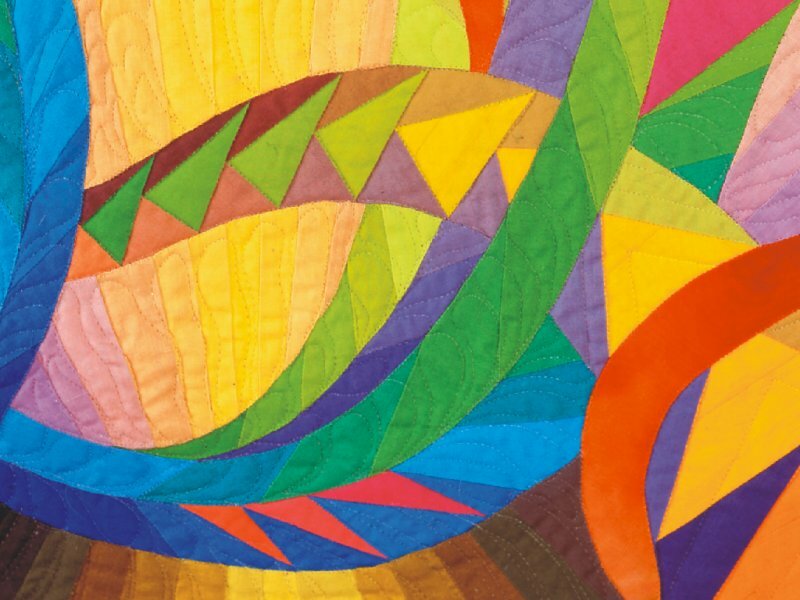 The quilt has several layers of visual activity, all weaving in and out of each other. 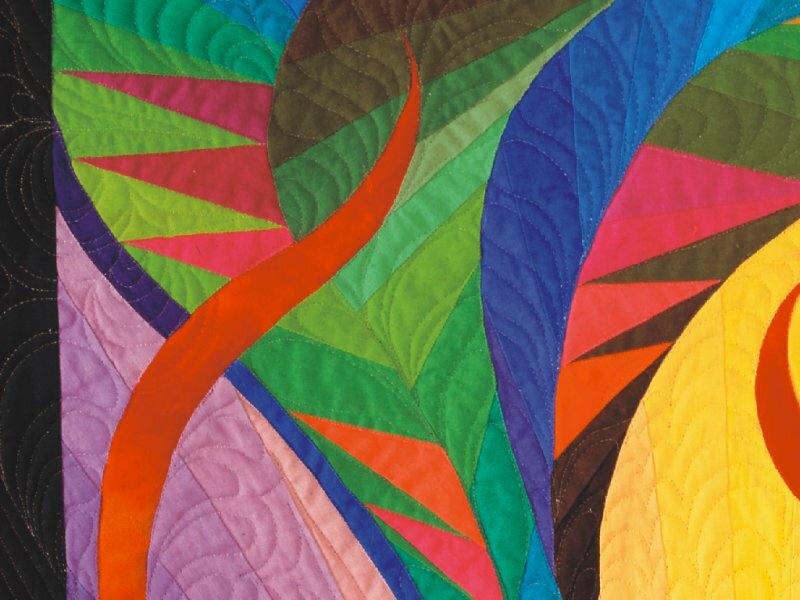 As I was piecing the quilt, I began to understand my dream. After 25 years working as a flight attendant, I was more than ready to quit even though I had three more years before I could retire. I imagined that not having to go to the airport and get on a plane any more would give me the ultimate feeling of freedom that flying symbolizes for me. 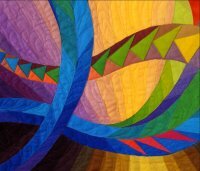 On the other hand, what was preventing me from having that ultimate freedom when I made this quilt, was FLYING. And one of the main reasons I was still flying is so that for the rest of my life I could fly free. Ah, What tangled webs we weave. 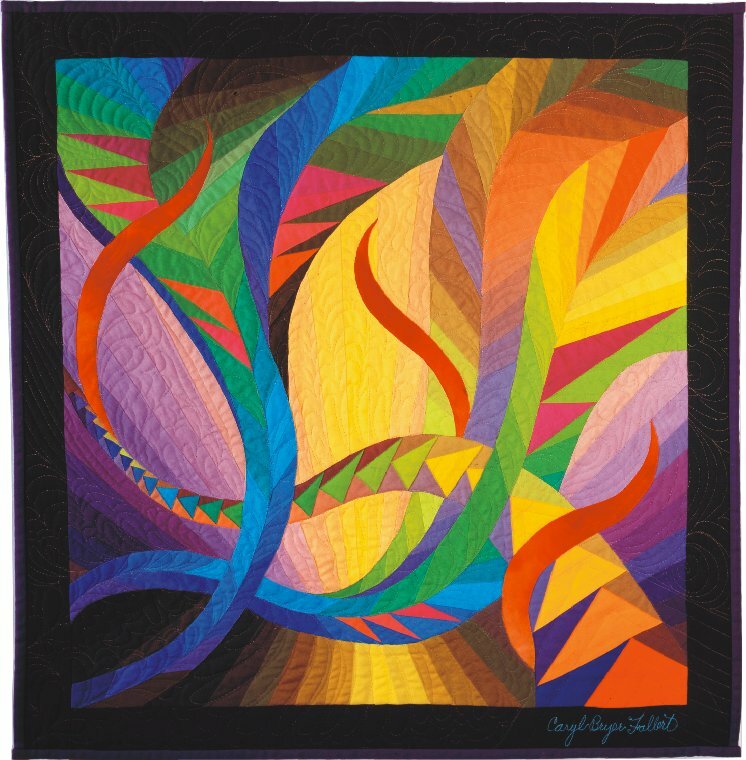 This quilt was string pieced, i.e. the full size drawing was cut apart, and strips of fabric were sewn directly to the paper sections. 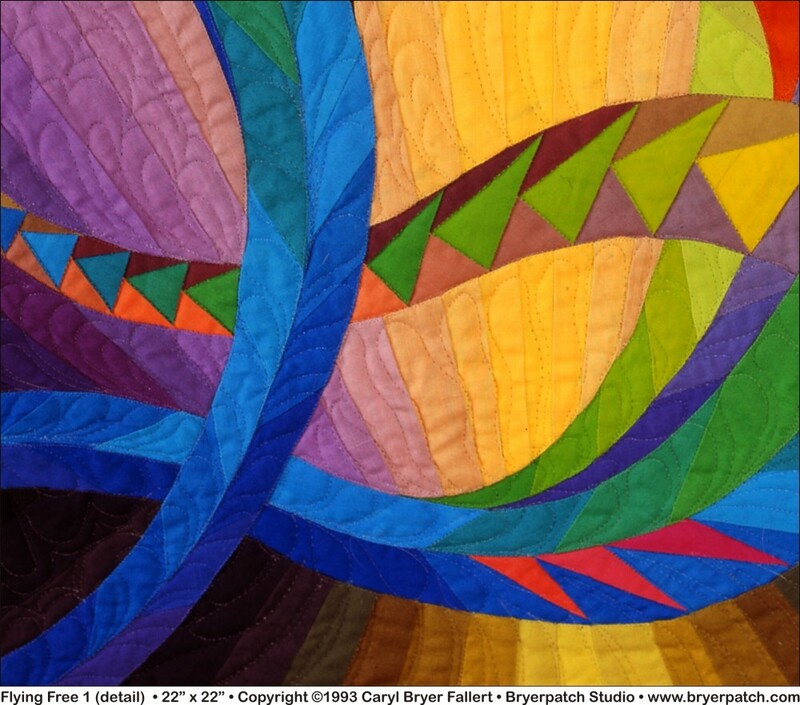 The paper was removed, and the sections were reassembled to form the quilt top. 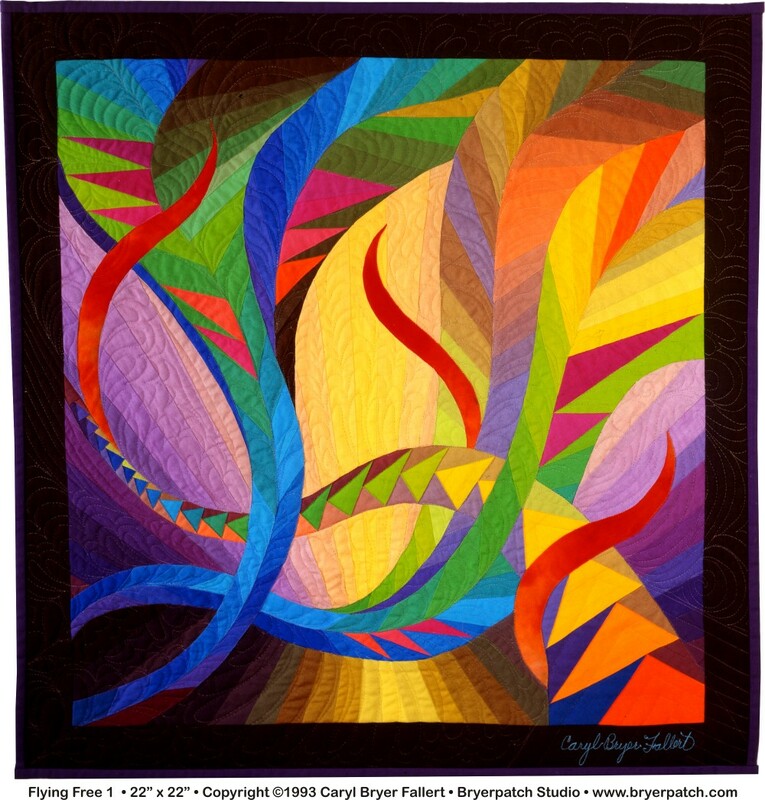 A variation of the traditional "Flying Geese" quilt block is incorporated into one of the curved and tapered templates. 100% cotton fabrics, hand dyed and hand painted in gradations of color and value, create the illusion of depth and space. All of the quilting was done with clear nylon filament. The freeform, organic patterns were machine stitched freehand, with no marking of the quilt top. FIBERARTS MAGAZINE, Spring 1996, p.